The generation of energy with solar power plants in the desert is a highly controversial issue. Which arguments do the opponents and the proponents put forward? To what extent do solar power plants have the potential to contribute to meeting Europe’s energy needs? What are the advantages and disadvantages of different means of energy production? Can we produce clean energy from the sun in the desert? Solar power plants are regarded as one possible solution for future energy supply problems. While dealing with this question, students will be exploring mathematical and physical principles and problems concerning solar power plants in the desert. How can electrical power be generated? 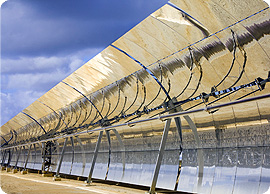 Which type of mirror is suitable for solar power plants? How many power plants are necessary in order to meet Europe’s energy demand? How can this energy be brought to Europe? Discussing possible ways of implementing the project “Desertec” is the final step of the teaching unit.